What are the Most Common Medical Errors? | Branch & Dhillon, P.C.Branch & Dhillon, P.C. When medical professionals make errors, these mistakes can often have life-altering (or even life-ending) consequences. Studies indicate that around 250,000 people in the U.S. die each year as a direct result of medical errors, while millions more are injured or made ill by drug-related mistakes. If you suspect that you are among these numbers, you may have some legal options. However, it is important to act quickly; each state has a fairly short statute of limitations, within which an injured plaintiff may file a medical malpractice lawsuit. 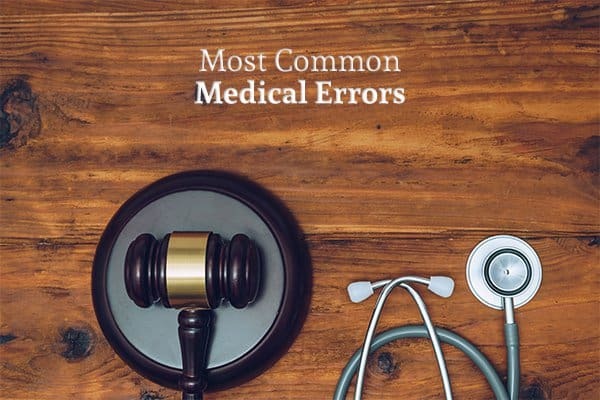 Read on to learn more about some of the most common medical errors in the U.S. Early diagnosis (and treatment) can be the key to recovery for several different medical conditions. Autoimmune disorders like Type I diabetes or Graves Disease can cause permanent organ damage if left unchecked, while illnesses like cancer may cross the threshold from curable to inoperable over the span of just a few months. Because of this, misdiagnosis is one of the most dangerous medical errors possible; unfortunately, it is also one of the most common. But misdiagnosis does not just include a physician’s failure to spot a serious or potentially life-threatening condition. For example, some patients may be informed they have terminal cancer and should begin making arrangements, only to later learn that their test results were misfiled (or misread) and they are cancer-free. While this news is a relief to those who thought they were out of options, the emotional turmoil and stress it can place on a family are tough to bounce back from. A related error involves delayed diagnosis. This occurs whenever a medical professional either misdiagnoses a known ailment or informs the patient that his or her symptoms do not seem to indicate any issues. Like misdiagnosis, delayed diagnosis can hamper one’s ability to seek necessary medical treatment early and may even lead to permanent physical or mental impairment, or even death. From pharmacists who inadvertently dispense the wrong medication to doctors who fail to account for potentially harmful drug interactions, medication errors injure millions of people throughout the country each year. Even over-the-counter medications can carry some serious side effects, and doctors who advise their patients to use such medications are required to address these risks. For example, acetaminophen overdoses are one of the most common causes of liver failure in the U.S. A doctor who recommends an acetaminophen-based painkiller to a patient who has a documented history of liver problems (or one who indicates that they drink heavily) may be putting this patient in danger. Many medication errors fall into the “failure to warn” category. Because medications can interact with everything from dietary supplements to certain foods, it is vital that doctors and pharmacists ensure that patients are made aware of any potentially harmful interactions. Issuing a prescription medication without providing these warnings or instructing the patient to seek medical attention if they begin noticing certain side effects can sometimes constitute medical malpractice. Another common medical error involves the use or implantation of defective medical devices. Some frequently-used devices like pacemakers, surgical mesh, artificial joints, and IV ports have recently been the targets of class-action lawsuits in which the plaintiffs allege that these devices malfunctioned and caused injury to patients. In many of these cases, an injured patient’s primary avenue of legal recovery will be against the device’s manufacturer; however, in some situations, a doctor or other medical professional may also be liable for failing to adhere to the manufacturer’s guidelines when implanting the device or by implanting a device that has previously been recalled. If you’ve ever undergone a surgical procedure, you may have been asked to take a permanent marker and apply an X to the body part undergoing the procedure. This is designed as a failsafe to ensure that surgeons perform the operation on the appropriate area of the body. However, this failsafe is not always enough to keep surgeons from operating on the wrong body part—or, in some serious cases, even amputating an otherwise healthy limb. Another relatively common surgical error involves items left in the patient’s body after a procedure. Surgeons and their assistants will generally perform a sponge and instrument count before and after each procedure to ensure that everything that has been used during surgery is present and accounted for. But there are many cases in which a miscounted sponge is inadvertently left inside a patient, or a catheter tip breaks off mid-procedure; if not quickly located and removed, these left-behind items can cause pain, infection, and other serious problems. Not all medical errors are considered malpractice. However, in some cases, a medical professional’s negligence may give rise to a legal claim—especially if this negligence resulted in serious injury. If you have concerns that you were the victim of medical malpractice, give the experienced attorneys at Branch & Dhillon a call. Our “No Win No Fee” arrangement guarantees that we do not collect a dime in legal fees unless you recover damages. We will work with you to evaluate your claim and provide information about your options.